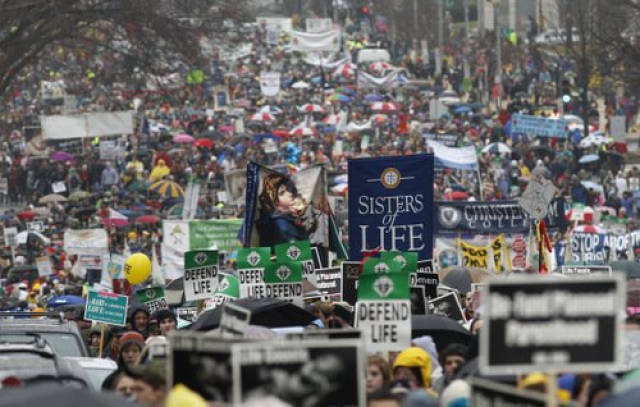 Once again, to the "great shlep"
2012 March for Life in Washington, D.C. This afternoon I will leave with eleven college students from the Catholic Center at ETSU to attend the national March for Life in Washington, D.C. This will be the fifteenth time that I have attended the March. Last year, after returning from the march a friend shared an editorial from a person who is pro-choice and who happens to have a comfortable office overlooking the march route. She disdainfully referred to the march in her column as the “great shlep” – looking down on the march goers from her office window. As you might imagine her article was not very complimentary. In honor of her though, I now refer to the March (at least in my own mind) as the “great shlep”. 1. To carry something heavy. 2. To carry something in a dragging fashion, as if tired. 3. To go somewhere, particularly somewhere far away or otherwise difficult to reach; often implies resentment of putting forth such effort. The elevator was broken, so I had to shlep the TV set up five flights of stairs. I shlepped my book bag behind me. I shlepped all the way out here from downtown so you could tell me you feel like staying in tonight? I think that the word fits. The marchers do carry something heavy – they carry the conscience of a nation. It is a conscience that is hurting yet not silenced. It is a conscience that affirms that there is dignity to all human life which must be upheld. It is a conscience which recognizes that whenever life is devalued in one area then all life is wounded and devalued. It is a conscience which recognizes that there is great harm in abortion – to the beauty of a child lost, to the soul and psyche of the mother and the father and to society as a whole. This year is the fortieth anniversary of Roe v. Wade. The millions of lives lost is staggering. In so many ways unimaginable. We are tired yet we will continue the shlep. Why? Because it is the right thing to do. History will judge every generation for what it stands for and as our knowledge grows regarding life in the womb I predict that future generations will look on ours and wonder how we could have ever allowed such a thing to happen; just as today we look on past generations and wonder how could slavery and the oppression of women have ever been justified. As we have seen before; just because something is the law of the land that does not make it right. Roe v. Wade is bad law which has wounded, weakened and impoverished the heart of our nation. In the “great shlep” we are going somewhere – not just to our nation’s capital for a one day event but to the future, to the point where the dignity of all life (from natural birth to natural death) is affirmed and valued. In the language of religion; we are marching to the Kingdom of God. For me, the March for Life is a continuation of the civil rights marches of the sixties. The paraphrase Dr. Martin Luther King Jr., the arc of history bends toward justice and that which is right. This is the objective truth that energized and fortified the civil rights movement of the sixties and their great work and it is the same objective truth which emboldens the pro-life movement. There is truth and it will not be denied and all which is untrue will eventually fall away. We are marching toward the future. So, once again, with prayer and humility I go to the “great shlep”. If I happen to see a woman disdainfully looking down on me and the crowds from her office perch I will smile and wave at her and maybe one day she will come and join us. There is a scene found in the beginning of the story Les Miserables (currently playing at theaters as an award-winning movie) that is quite striking. Jean Valjean has been freed from his twenty year imprisonment for stealing a loaf of bread yet he is still ostracized by society due to the identification papers he must carry on himself. The papers testify that he is a former convict and therefore no one wants anything to do with him. Embittered by this, not able to find work and left starving, Jean Valjean finds himself taken in one night by a Catholic bishop. He is given a warm meal and a place to sleep. Yet, in the middle of the night in an act of desperation and anger, Jean Valjean makes off with the bishop’s silverware. He is caught by the local authorities and brought back, yet the bishop (at this point) does a truly remarkable thing. Knowing full well what Jean Valjean has done, the bishop tells the officers that he freely gave him the silverware and he even tops this by giving him his last two candlesticks. Jean Valjean is freed and by this act of charity is given a new life. In light of this Sunday’s gospel (Jn. 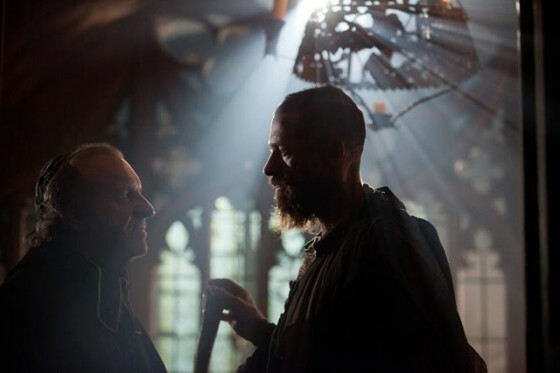 2:1-11) I would say that this bishop through his action of forgiveness and mercy not only gave Jean Valjean a new life but invited him into the wedding banquet. 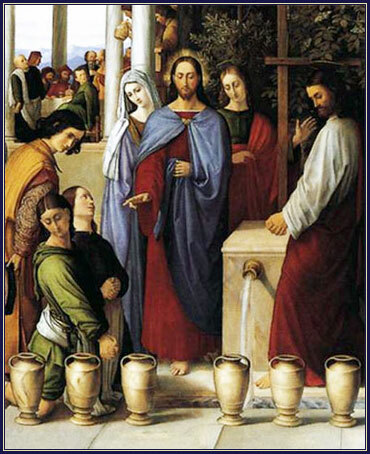 The turning of water into wine is the first miracle of Jesus’ public ministry. As Christians we rightly see this miracle and the context in which it occurs (the wedding banquet) as a foreshadowing of the coming Kingdom of God which Christ comes to inaugurate. The wedding banquet is a celebration of great joy and union. The Kingdom of God is the fulfillment of all humanity’s hope and yearning where heaven and earth are once more united. At the wedding banquet water is turned into wine; in the Kingdom of God the daily and mundane is transformed into moments of rich encounter with the divine. 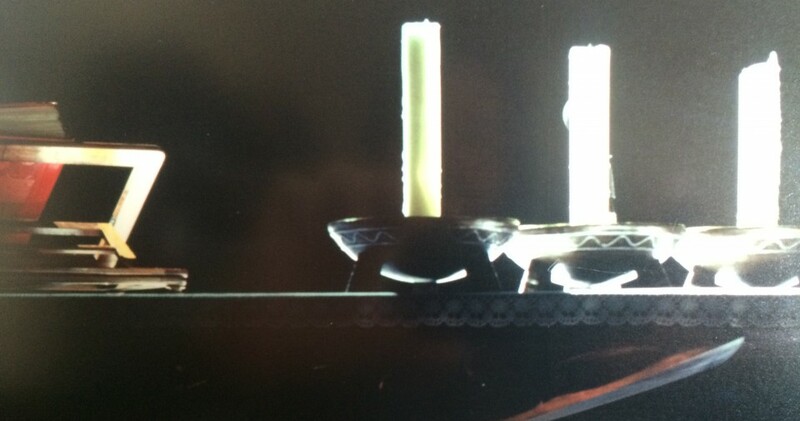 The wedding banquet and its miracle is rich in typology and in symbols for Christians yet I would like to continue to hold this miracle story in dialogue with the action of the bishop from Victor Hugo’s book in order to bring out another dimension found within the gospel story. As Christians, not only are we to rejoice in the banquet ourselves we are also meant to invite others within. In truth, we cannot fully celebrate the banquet ourselves unless we see to the needs of others; unless we also invite others within through acts of mercy and love. Mary, as always, is the model in this for us. Mary is a woman fully immersed in the culture of her time and she knows the importance of the wedding banquet. She is concerned for the good of this young couple and she knows how poorly it might reflect on them if the wine runs out. Possibly they were from poorer families who could not afford a lavish celebration. It is Mary’s awareness of the need of this young couple and her concern for them that leads her to her son just as it is the bishop’s awareness of Jean Valjean’s need that leads him to mercy. Confident in the mercy and love of her son, Mary does not even question or argue after making her request known rather she turns to the servers and simply says, Do whatever he tells you. The logic of the banquet (which is the logic of the Kingdom of God) is that mercy and love must be extended. It is not enough to celebrate the banquet for ourselves; in fact that is a truly impoverished celebration. To truly celebrate the banquet we must be willing to let go of ourselves – our needs and wants – and we must be willing to extend love and mercy to one another – to family, to friends and to strangers. It is that simple. This is the logic of the banquet and it is the logic of the Kingdom of God which overcomes all the false philosophies and sad divisions of our world. As Christians, we are called to live the logic of the wedding banquet. To live a life in the logic of the banquet – helping to extend God’s love and mercy to all people – is to know God and to share already in joy of his Kingdom. Have this mind among yourselves, which was in Christ Jesus, who, though he was in the form of God, did not count equality with God a thing to be grasped, but emptied himself, taking the form of a servant, being born in the likeness of men. And being found in human form he humbled himself and became obedient unto death, even death on a cross. These passages are important, I believe, because they can bring us into the mind of Christ and into a deeper awareness of how he accomplished his salvific mission. In the Creed we profess the great mystery that Jesus is fully God and fully human – “God from God, Light from Light, True God from True God … and by the Holy Spirit was incarnate of the Virgin Mary, and became man”. On the surface we can assume that Christ accomplishes his mission by the exercise of his unique power of being the Son of the Father, the second person of the Trinity. Christ on his own, by his independent strength of will, accomplishes his task. I do not believe this is true and I point to the above passages quoted for a different interpretation. In Philippians we are told that Christ emptied himself. The Son of the Father lets go of his glory. In the third chapter of Luke’s gospel we are told that heaven was opened and the Holy Spirit descended upon Christ. 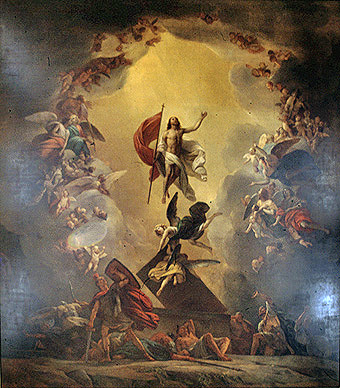 By holding these passages together we are brought to the awareness that Christ does not accomplish his salvific mission through the sole exercise of his glory of being the Son of the Father; rather, the Son empties himself thus both allowing the full humanity of Christ to cling to the will of the Father and allowing the Holy Spirit to fully work through him. Christ is not a lone cowboy who rides into town one day and by his own power gets rid of the bad guys. Rather, in Christ, we find humility, obedience, joy and love at work. 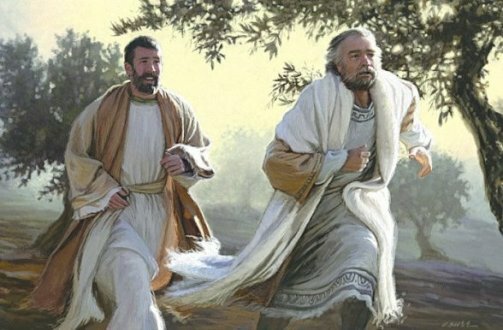 The Son emptying himself, the full humanity of Christ clinging to the will of the Father, the joy of the Father in his Son, and the love of Holy Spirit flowing between Father and Son and through the Son to bring forth miracles and accomplish the salvific event. It is not “will to power” that accomplishes the salvific event but rather humility and the obedience of love. Wherever the Son is, there also is the Father and the Holy Spirit. In Christ, we find the whole Trinity at play. Through our baptisms we are brought into the very life of the Trinity and we also are brought into this very dynamic. What we can accomplish in our lives as Christians and as Church is not accomplished by what we can do on our own (the sad and tired logic of our world) but rather by learning to live as Christ lived – emptying ourselves of glory, clinging to the will of the Father, and receiving the love of the Holy Spirit. A good meal with friends creates a human space in one’s life that not only nourishes the body but also the soul and spirit of a person. This is why feasts are so important. For a special feast we set aside time from the rush of life, we give attention to decoration and setting, we invite those we love and care about and together we sit down for a fine meal and for valuable and rare time to be present to one another. In the utilitarian rush of our world a feast can even be a subversive action where we conspire in love to say that there is so much more to life than what can be measured and commodified. 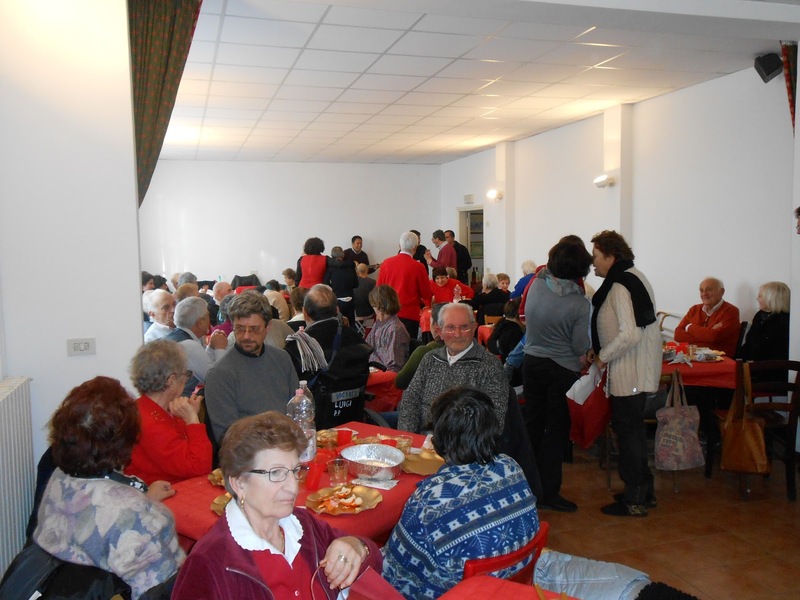 For thirty years now the Community of Sant’Egidio has been holding such a feast (the Pranzo) every Christmas day. Thirty years ago the Community hosted around fifty friends made up of the poor, the elderly and the physically and mentally handicapped for the first Pranzo. This year it has been determined that the Community hosted over one hundred and fifty thousand people around the world for the Pranzo. At the Basilica of Santa Maria in Trastevere the pews inside the church were set aside and tables and chairs set up and friends gathered together for the meal. In New York City a few Christmas dinners took place for the elderly in nursing homes and for the easily forgotten homeless. 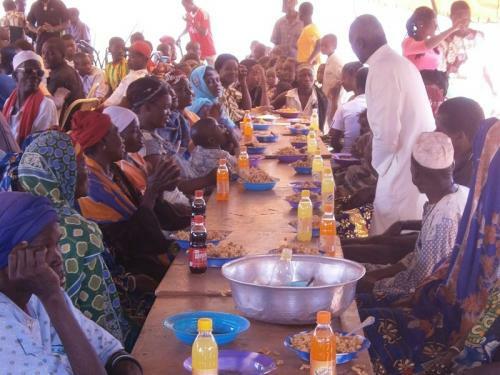 In parts of Africa whole villages gathered together for the feast. 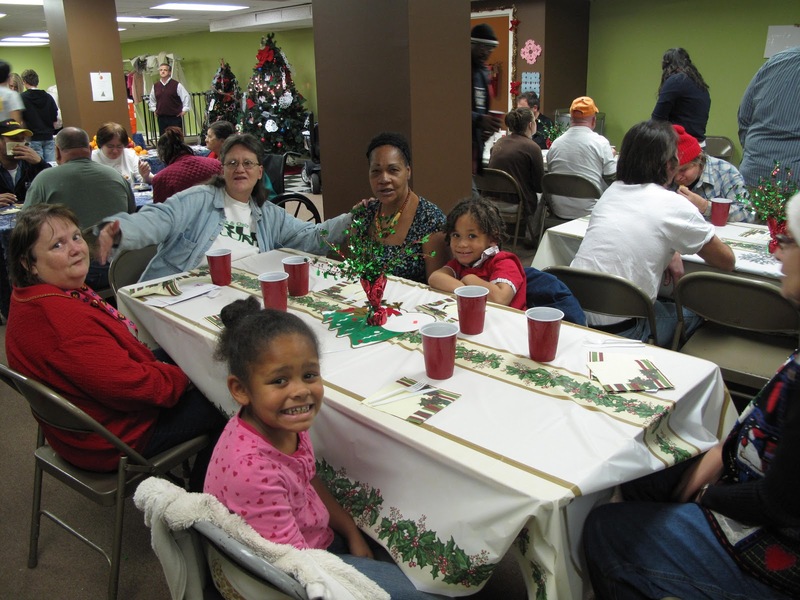 In Johnson City, TN the John Sevier Center (a low income housing center) provided the location for the Christmas Pranzo where fifty-five persons were served. The Pranzo connects Christians once again with the ancient tradition within our Church of feeding the poor specifically on Christmas Day and the Pranzo flows directly from our celebration of the Eucharist. We all are familiar with the image of the newborn Christ wrapped in swaddling clothes and lying in a manger (the place where animals are fed). Christ is indeed the Bread of Life and as we are nourished by this Bread that is Christ himself then we, in turn, are to help in nourishing our world. This nourishing is more than just the physical, it is also a spiritual nourishing that we are to assist by actions that remind us that yes, we are human, we have dignity and we are meant for more than an isolated existence. In fact we are meant for relationship and friendship with one another and even with God! Christ came, we are told, that we might have life and life to the full! In many ways the Pranzo is a crèche for our modern and distracted world. It is a continuation of the dream of St. Francis. This year I was able to participate in the Pranzo at Primavalle on the periphery of Rome. 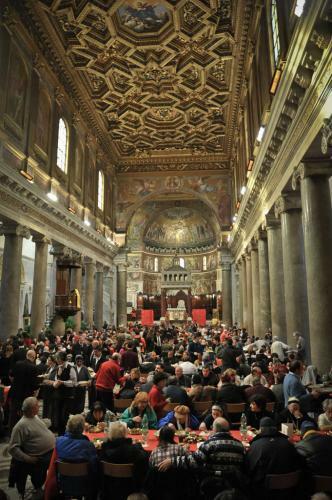 (In Rome alone this year there were over one hundred Christmas meals in churches and other locations.) Primavalle is close to what we in America would term a “senior citizen center”. The Community of Sant’Egidio runs various activities and prayer at Primavalle which touches and nourishes the lives of the elderly, the handicapped and the poor in the area. For weeks the community worked and planned the Pranzo. Gifts were purchased and wrapped, invitations were sent out, decorations were acquired and the multi-coursed meal was prepared. On Christmas day following the Mass tables and chairs were set up and decorated and over one hundred people gathered together in friendship to celebrate the feast! At one side of the room sat the image of the infant Christ in the manger; in many ways presiding over the feast! At the end of the meal each of the invited friends received an individual gift. Afterwards the building was cleaned by many people and all involved were tired but I could not help but be struck by one person who was joyfully and unself-consciously whistling to himself while helping to clean. Joy, we are told, is the surest indicator of the presence of God.